Anwar Shaaban. [Source: Evan Kohlmann]The Islamic Cultural Institute mosque in Milan, Italy is dominated by Al-Gama’a al-Islamiya, the Egyptian militant group led by Sheikh Omar Abdul-Rahman. 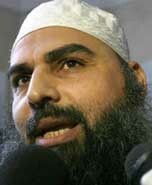 The imam of the mosque, Anwar Shaaban, is a leader of that group and also a leader of the mujaheddin efforts in Bosnia. The Islamic Cultural Institute serves as a transit and logistical base for mujaheddin coming or going to Bosnia (see Late 1993-December 14, 1995). After the 1993 WTC bombing, US investigators will discover heavy phone traffic between the Milan mosque and the Jersey City mosque run by Abdul-Rahman. Furthermore, they learn that bomber mastermind Ramzi Yousef used the Milan mosque as a logistical base as well. [Chicago Tribune, 10/22/2001] Yousef also prayed at the Milan mosque prior to the WTC bombing. [Gunaratna, 2003, pp. 171] Shaaban is a close friend of Talaat Fouad Qassem, another leader of Al-Gama’a al-Islamiya and one of the highest ranking leaders of the mujaheddin fighting in Bosnia. Qassem is directing the flow of volunteers to Bosnia while living in political asylum in Denmark (see 1990). [Kohlmann, 2004, pp. 25] In April 1994, seven Arab men living in Denmark, including Qassem, are arrested. US prosecutors will later claim that fingerprints on documents and videotapes seized from the men match fingerprints on bomb manuals that Ahmad Ajaj was carrying when he entered the US with Yousef (see September 1, 1992). A raid on one apartment in Denmark uncovers bomb formulas, bomb making chemical, sketches of attack targets, some videotapes of Abdul-Rahman’s sermons, and a pamphlet claiming responsibility for the WTC bombing and promising more attacks. Also, phone records and documents found in Abdul-Rahman’s Jersey City apartment show the men in Denmark were communicating regularly with Abdul-Rahman. [New York Times, 4/15/1995] But no one in either Milan or Denmark will be charged with a role in the WTC bombing. Danish police will later say that none of the seized documents indicated that the Arab men personally took part in the bombing. The men all are released and ironically, two of them are granted political asylum in Denmark because they are members of Al-Gama’a al-Islamiya, which the Danish consider to be a persecuted group. [Associated Press, 6/28/1995] In 1995, an Italian magistrate will issue arrest warrants for Shaaban and 60 other extremists (see Late 1993-December 14, 1995), but Shaaban will flee to Bosnia, where he will die of bullet wounds in unexplained circumstances (see December 14, 1995). [Chicago Tribune, 10/22/2001] The US government will later call the Islamic Cultural Institute al-Qaeda’s main logistical base in Europe and some evidence will link figures connected to it to the 9/11 plot (see Late 1998-September 11, 2001).